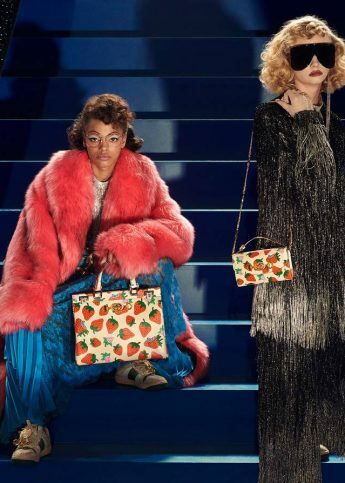 Alessandro Michele strikes again proving his worth as the newfound Creative Director at Gucci with a rose-tinted spectacle collection rife with nostalgia. Can we still call it androgyny if menswear shapes are doused in floral patterns, made of luxe materials and produced in saturated colour ways? Broad ties were tied in fat knots set against devore printed suits in custard yellow or flowing turquoise palazzo pants and shirt co-ords. Oversized glitter brimmed glasses will no doubt become the item copied by every high street store by summer. Gucci’s signatures were revamped. The classic red and green stripes and double Gs were still present, of course but the Gucci name popped up elsewhere. Scribbled into a handwritten print, the branding was unmistakable alongside G buckles on belts and shoes. The details were what made the collection. Fingerless crocheted or gold leather gloves covered almost entirely by bling on every finger, embellishment was the overriding theme with no surface left bare. Pussybows, a new favourite of Michele, were this season large enough to cover the entire chest in ballerina pink chiffon.